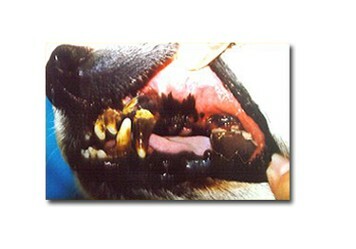 Dental disease is the most common ailment in pets, affecting 70% of dogs and 60% of cats over the age of four. Dogs and cats are affected by a variety of different dental disorders, but the most commonly diagnosed condition is periodontal disease, or inflammation and infection of the gums, bone, and support structures of the tooth. 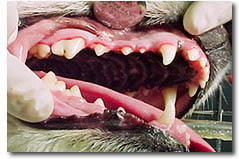 Dental disease is generally more common in small breed dogs than in large breeds. When plaque and dental tartar build up on the tooth, this infection causes gingivitis and periodontal disease, which in turn can allow bacteria to enter the bloodstream. When this happens, problems with major organs, such as the heart, kidneys, and liver can develop. Therefore, not only does this condition cause bad breath, tooth loss, and pain, but it can also cause major health problems in your pet. A recent study shows that pets with good dental health live, on average, TWO YEARS LONGER than pets with poor dental health. Brushing- This is the best option and the most effective, if done regularly. 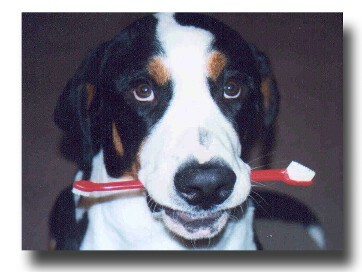 Only toothpastes made specifically for pets should be used. Hill's t/d tartar diet- We recommend using this specially formulated dog food as a treat. Almost as effective as brushing. Oral rinses- These anti-bacterial rinses slow down the buildup of plaque if used regularly. Over-the-counter dental chews- Items such as Greenies and other dental chews available in pet stores have varying degrees of effectiveness. You should consult a veterinarian before using these products. Dry dog food- Simply feeding dry dog food instead of canned food will help slow the buildup of dental tartar on your dog's teeth. Thorough dental exam to check for periodontal disease, broken teeth, loose teeth, and abscesses. Complete dental scaling, above and below the gumline, to remove tartar and plaque buildup. Extraction of any diseased or painful teeth. Complete polishing of all enamel surfaces. Give us a call if you have any questions about your pet's dental care, if you'd like an estimate for a dental cleaning, or if you would like to set an appointment. When you call, ask us how you can get $30.00 OFF a professional dental cleaning procedure.